In an attempt to redeem the time and learn from the lessons of the last year, we have set out to outline our goals for the year. Last year, we embarked on our adventure with a vague idea of what we needed and wanted, but with little preparation only a few of those ideas came to fruition. We both feel that we could manage our time better so by the grace of God we are writing our plans in pencil! 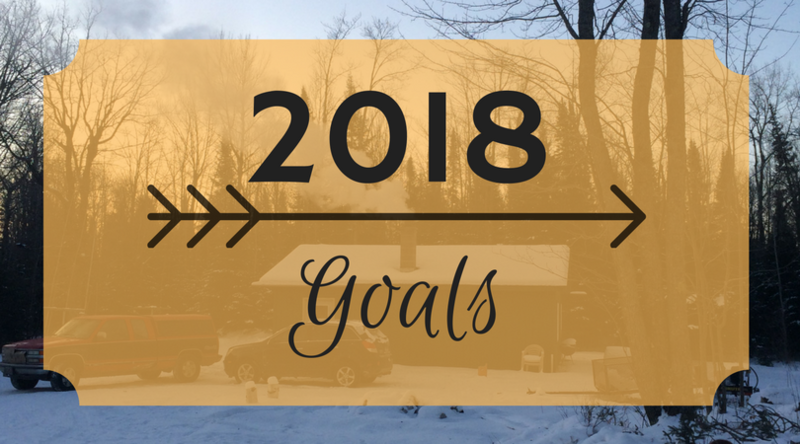 Upgrading our cabin and making building a garage are the two biggest overarching goals for 2018. Last year, electricity was our biggest upgrade; this year, we want to put in a septic system, drill a well, and build a bathroom addition. In addition to that, we want to build a garage so that we have more storage space and a place where Mark can build things. One of the major pitfalls we fell into last year was not having people and paperwork in place ahead of time. It makes sense now, but then we had no idea how booked builders, designers and installers are come summer. Throughout the winter we are going to make our best attempt to have everything lined up ahead of time. Our driveway is in rough shape and has never been improved to the level we would like. Improving our driveway will make other building goals easier for us and others working on them. we plan to have someone with a dump truck and some sort of grading equipment add some gravel and level our driveway and then start maintaining it ourselves with our tractor. We are off to a great start by already having a design and a permit in place as well as someone lined up to do the installation. That will commence in the early spring—or whenever our installer returns from wintering in a warmer climate. This septic system is designed for our future house in addition to our cabin. This is another thing that we won’t actually be doing much ourselves, we just need to get someone else to do it and write them a check. This is something we had intentions of doing last year, but didn’t get to. This year we plan to hire a contractor to do some of it and then do the finish work ourselves. I really miss having a garage. There are so many times there is something that I think of that I would like to do, but they are things that I would do in a garage and I either need to figure out another way to do them or I just don’t do them. The latter happens more than I would like. I plan to hire a contractor to complete the foundation and maybe the roofing, but other than that I plan to build the garage myself, with help from friends and family as needed. I want to build it both because I like to build things and in order to gain construction experience to be more prepared to build a house in a few years. I plan for a post and beam frame with cordwood infill, but will likely leave the cordwood infill until next year and use plywood temporarily. I love planting things and growing things and last year I did some of this even though I didn’t really have time. This year I want to continue planting, but in a more restrained and intentional way. I will not be planting a full garden of peppers, tomatoes, onions, beets and more. I will have a few things I am going to plant in the garden, but it will be more limited. We also want to get several animals, but realize we don’t have time for all of the ones we want. We decided that this year isn’t the year for goats or rabbits. We still plan to get another cat and are up in the air about chickens and a dog (these aren’t going to be goals this year, nut if they do happen that would be nice). After writing this all down we see another busy year ahead of us. 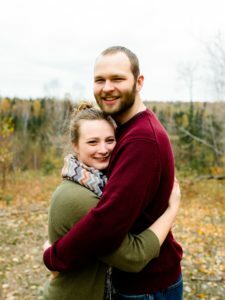 We don’t know if we can accomplish this much in a year, especially with all of the other things going on in our life that aren’t related to our home or blog. Hello! My name is Tonia. I’m the person you bought the cabin from. I’d love to hear about/see your progress! I loved that beautiful lot and was very sad to have to sell but it’s what I needed to do to start my new life as well. I love my little 1932 Craftsman home in Cloquet. I’ve made it my own with personal touches but still wonder how I could’ve made it work out on the Jackson Road. I’m excited for you both! Hi Tonia, We didn’t meet all of the goals we set out to do last year, but we do have a bathroom and running water now, so it’s like a real house. Glad to hear you’re settled into your new place in town.